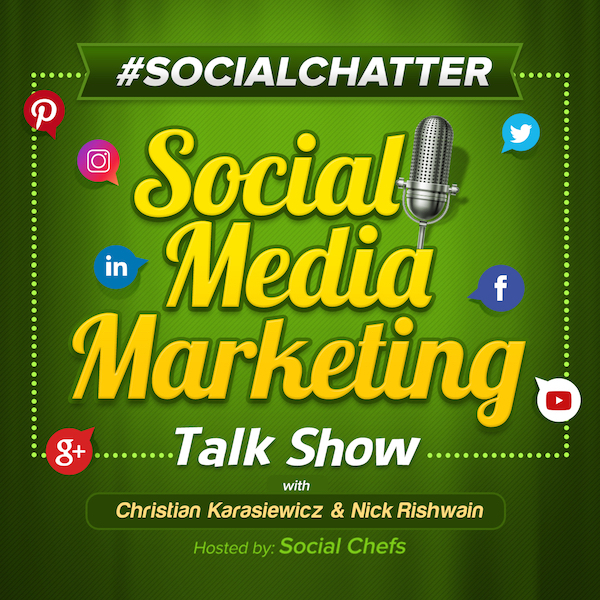 Welcome to this week's episode of Social Chatter, the longest running social media marketing talk show where we cover the latest social media news from this past week. As a reminder, each episode of Social Chatter is available as a blog post, video or you can listen to the Alexa Flash Briefing. For those of you who missed last week's show with Phil Gerbyshak, Christian Karasiewicz and guest, Marc Ensign, you can find it here. Let's see what's new in social media this week in social media news. In LinkedIn news, they are rolling out a host of Linkedin messaging updates to make it easier for you to communicate with others. Here's a look at each of these new updates to messaging on LinkedIn. One feature LinkedIn is adding is the ability to increase the size of the compose box. Sometimes you need more real estate to type out your message. Now, you can expand the message compose box on mobile and desktop. Simply tap on the arrow to increase the space for sending messages. A second feature is the ability to share attachments in LinkedIn messages. You can now attach a resume, PDF, DOC, XLS and PPT files directly in LinkedIn messages. Here's how this new feature works. A third feature LinkedIn is adding is to send group messages. You can now create group messages on LinkedIn by tapping on the "+" icon when viewing LinkedIn messages. LinkedIn is planning to use "smart suggestions" to suggest who all you should add to your group message. You can now @ mention someone in your next message on LinkedIn. Type the @ sign and then the persons's name to mention them in your messages. Another feature that LinkedIn is adding is the ability to copy and paste images, screenshot and more direct in your next message. This currently works from the web and will make it easier for you to have more conversations with your connections on LinkedIn. Overall, these new features will help you as a business better communicate with customers. For example, the ability to finally attach files makes a lot of sense on LinkedIn. Otherwise, we spend our time using other messaging platforms to send files between people we do business with. To read the announcement about these new LinkedIn messaging updates, click here. In Instagram news, you can now see when someone is active on Instagram so that you can send them a direct message with the new Instagram dm activity status. Instagram is making it easier for you to see where someone is active on Instagram. Now when you go to send someone a direct message, you will see a green dot next to their profile picture. Instagram notes that you can only see someone's status for people who follow you or who you have talked to on Instagram. Users will also be able to hide their status from the settings menu. While this feature is new to Instagram, Facebook has had it for years. As a business, you should find this particular feature useful if you spend a lot of time sending direct messages to customers through Instagram. To read more about the Instagram DM activity status for Direct Inbox, click here. Also in Instagram news, they are testing a feature to allow public Instagram accounts to remove followers. Up until now, if you needed to remove someone as a follower, such as an ex or a disgruntled customer, you couldn't. The only options were to block them completely, meaning they couldn't see any of your updates or leave your account completely open. Now, Instagram is testing a third option - the ability to remove someone as a follower. When you do this, the person won't be notified that they were removed. It also avoids the uncomfortable situation where someone realizes they were block on Instagram. Right now, you can find this option (if you're one of the luck testers) under your Profile page. From there, tap on followers and you should see a three vertical dots icon. When you tap on that, you will see an option to remove someone. As a business, this feature can be particularly useful. Sometimes you have a disgruntled customer who just needs some time to cool down. Instead of blocking them and making the situation worse, you can just remove them as a follower on your Instagram channel. You can read more about Instagram testing allowing public accounts to remove followers here. In Facebook news, they are joining Google, Microsoft and Twitter and participating in the data transfer project, a way to make it easier for you to transfer your data into and out of other online services. While Facebook has made improvements to give you better access to your Facebook data, it can be a challenge whenever you want to move platforms. You essentially have to start from scratch. Fortunately, Facebook is joining Google, Microsoft and Twitter as part of the project. The goal of this project is to help simplify moving your data between multiple services. For example, you may use Facebook to connect with friends and family. Instagram might be where your business connects with customers and you may use other apps to analyze your customer data. While the data transfer project is in its early stages, this partnership would help sync your data between the services so that you can get a better picture, while still having your data protected. You can read more about this program that Facebook is participating in here. In addition to sharing the latest news from this past week, we also highlighted some great social media tools and apps for you to check out. The first tool that we have discovered this week is called Standuply (web). Standuply is a bot for Slack. It can help you manage a number of your tasks on Slack. For example, it can help you with meetings, share voice and video, gather performance data and more asynchronously. You can start using Standuply for free on Slack using the link below. Prices then increase to $5 and up depending on the features that you need. The second tool that we have for you this week is CrowdTangle, a Google chrome extension. CrowdTangle, a Facebook-owned company, is a social media monitoring platform for publishers and brands. With their Google Chrome extension, you can keep track of who is sharing your links, how often they're shared, and what they said about them. Here is what the CrowdTangle Google Chrome extension looks like. You can install the extension for free and start seeing who is talking about your brand on Facebook, Twitter, Reddit and more! That's it for this week's show! To watch next week's episode of Social Chatter, your weekly social media marketing talk show, tune-in here to find out what's new in social media! If you have any questions about of the social media news or tools that were mentioned this week, please share them with us on Facebook, Twitter, LinkedIn or in the comments below. Christian Karasiewicz Founder, Social Chefs Founder and CEO of Social Chefs, a digital marketing agency. 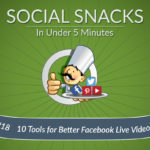 I host two shows, #SocialChatter, the industries longest running social media marketing talk show and Social Snacks, 5 minute or less social media marketing tutorials. Social Chefs provides fast, professional training on social media marketing for all types of businesses. Learn how to implement social media tactics on Facebook, Instagram, Twitter, Pinterest, YouTube and more that you can start implementing in your business today to help you sell more products!